In 2006, Onor Goin was a critically ill man, on dialysis, when the Dallas morning news wrote a story about Onor, known as Bouncer, and his family. 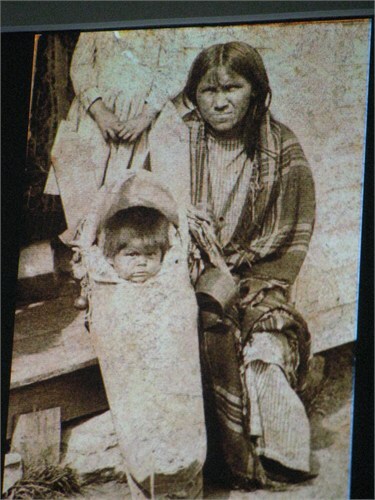 Bouncer’s family was typical of a Native American family whose members had “married white” and tried to leave their Native heritage behind, not because they wanted to, but as a matter of self-preservation. John Williams and Eliza Wood were Cherokee and born in Georgia. Their daughter, Sophia would marry Thomas G. I. Estes in Alabama in 1868. From there, Sophia and her family would become white, as a way of protecting themselves and their children. Sophia’s sister, Eliza Wood Williams would marry George Washington Goin, Bouncer’s ancestor. Some Cherokees who were headed for Mexico settled in North Texas, the area surrounding Tarrant among them, in particular, the city of Watauga. They called this community, “Unega” the Cherokee word for “white.” On the deeds, it was spelled Onega. In 1880, the town no longer wanted an Indian sounding name, so they drew slips of paper for a new name and it became Aubrey. However, when the Cherokee families originally settled here, it was an untamed frontier, perfect for people who didn’t want to be found, according to Richard McCaslin, a history professor at the University of North Texas. The photo above is of Sophia Williams Estes, the sister of Eliza Wood Williams Goins, having just arrived from the reservation in Oklahoma. After that, she became a Black Dutch transformation, according to Bouncer. The next picture is a large family photo take in 1885 in Aubrey. Everyone was dressed entirely in “white apparel” with no hint at all of Nativeness. Another 55 years later, Bouncer was crawling under his grandmother’s porch retrieving potatoes from where they were kept, where it was cool, when he overheard relatives talking about the Indians and his grandparents would talk in a language he did not understand. When he asked about the word Indian, once, his mother slapped him across the mouth. His uncle chopped wood and chanted to the sky. Him mother told him to stay away from that uncle, that he was crazy. The family quietly practiced Native medicine, but it was never called that. And the family made moonshine, Bouncer’s grandmother in particular. When his grandmother, Granny Laura, was elderly, Bouncer would sneak her a bit of moonshine, since she was living in her tee-totaler daughter’s house, and Granny Laura would tell him about smoke signals between her husband and the Comanches. He heard the stories of old Georgia, how the houses were invaded by solders, the violence and the death along the Trail to Oklahoma and Texas – and more. In 1953 while Bouncer was in the service, Granny Laura died, and she left her house to Bouncer. He came home, ready to settle down, got married and began to remodel his grandmother’s house. He pulled up the old linoleum. Underneath he found some old newspapers, dating as far back as the 1820s, and some were marriages, births and obituaries, with names and words underlined. He gathered them all up to throw away, but his wife advised against it. In time, Bouncer came to realize that these old clippings held the secret to his family’s past and he began a scrapbook, and began talking about his finds. Realizing the significance of the story, he began to tie it together with official documents, census records and historical documents of the region. Finally, in 1999, Bouncer began to write about his family history, and his other historical finds, publicly for the Aubrey newspaper in a column called “Talk Under the Tipi.” He was no longer willing to keep the secret and felt compelled to share the gift his grandmother had left to him. Bouncer joined his grandmother on July 24, 2009, but not before he preserved the story of his family and ancestors. You can read his columns today and about his heritage at http://www.bouncergoin.com/. As fascinating as it is heartbreaking! The same story for Amerindians of all nations across the Americas. Such a shame. Searching for NA in my Goin ancestry I’m left to wonder that by sharing this gift was Bouncer the son of George Washington Goin, whom was a son of Pleasant Goin, whose parents were Levi and Elizabeth Stallings Goin, my third great uncle and aunt. I am so thankful for people like Bouncer who have cared more about the truth than the opinions and fears of others. This story is so close to mine; my GGGrandmother was Native American, she was born in Tennessee and ended up in Tarrant County, Texas. Family histories attempt to cover up, downplay, ignore etc. her Native heritage. In trying to do my family tree since 1982, I find that we have many known Cherokee and Choctaw families intermarried; but not many who have been willing to accept this. The Texas historians have focused on the “Cowboy/Pioneers”, discounting our rich Native Heritage. This is very sad, especially for our children. I know that those were dangerous times, not only during the Removal, but also the Civil War years. Still, we will be all that we are, now, then, and forever. I’ve heard similar in my Family saying it wasn’t good to be “Indian.” My Mom said people would call you names way back in the early last century. I wondered why! Sooo very sad. My ancester was John Liles b 1750-60 in NC. He was an Indian Trader there. Thats all i can find of him so far.i believe he married a Cherokee lady. But ill keep looking!